If this rice dish is not the most beautiful and sophisticated dish you've ever seen, then I dont' know what is. You've got sour cherries, saffron, and pistachios, which don't only add exquisite colors to the dish but also make it taste like something worthy of fairies and gods. There are different ways of making this rice dish. Some make it with meatballs, some use cooked saffron chicken pieces in it, and some just opt out the protein altogether, which make it vegan and vegetarian friendly as well. So omit the meat, if you're a vegan or vegetarian. Soak the rice and with water and 2 1/2 tablespoons salt for 2 to 4 hours. In a large bowl, mix the ground beef with grated onion and salt and pepper, and start shaping the meatballs. The meatballs should be about 2/3 of an inch in diameter. I've found that a teaspoon measuring spoon is the best tool to size the meatballs. Arrange the meatballs in a pan and cook them over medium low heat until they are cooked through. Add water to a large pot and bring it to a boil. Drain the rice, and add it to the pot. Boil for 6 to 8 minutes, gently stirring with a slotted spatula. The rice must grow and cook, but not overcook. Bite a few grains to test the rice. Drain the rice in a large, fine-mesh colander. Make sure there is no grain of rice left in the pot. Put the pot on the stove top again and increase the heat until the bottom of the pot is dry. Add ¼ cup of vegetable oil, and let the oil get hot. Take one spatula full of drained rice at a time and gently place it in the pot. then add a layer of the sour cherries, and meatballs. Repeat these steps, adding rice, sour cherries, and meatballs in alternating layers, and shaping the rice into a pyramid as you go, then pour the reserved sour cherry syrup over the rice. Poke 4 or 5 holes in the rice pyramid with the handle of the spatula. Add the remaining oil over the rice. Place a dish towel or 3 layers of paper towel over pot and firmly cover the pot with its lid and reduce the heat to medium low. Cook for 40 minutes. To serve, take a spatula full of rice and place it in a bowl. 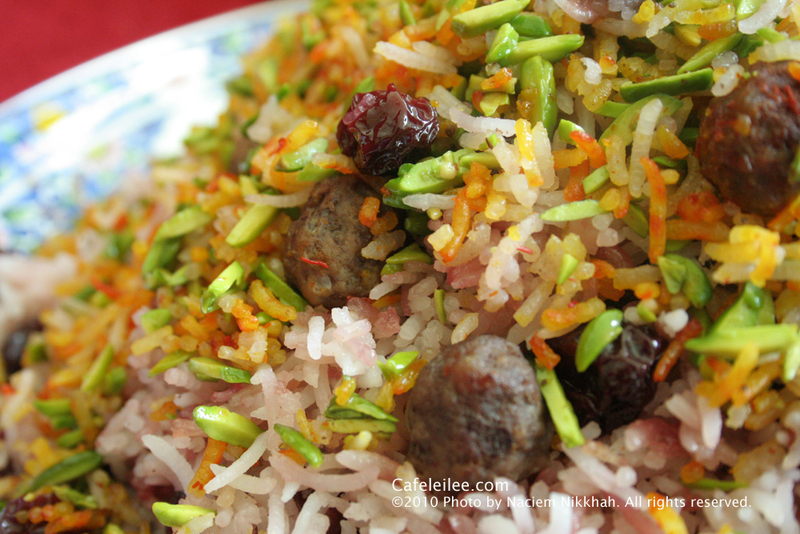 Add liquid saffron, and slivered pistachios to the rice and mix. Using spatula place the remaining rice on a serving platter without touching the crust. Mound rice in shape of a pyramid. 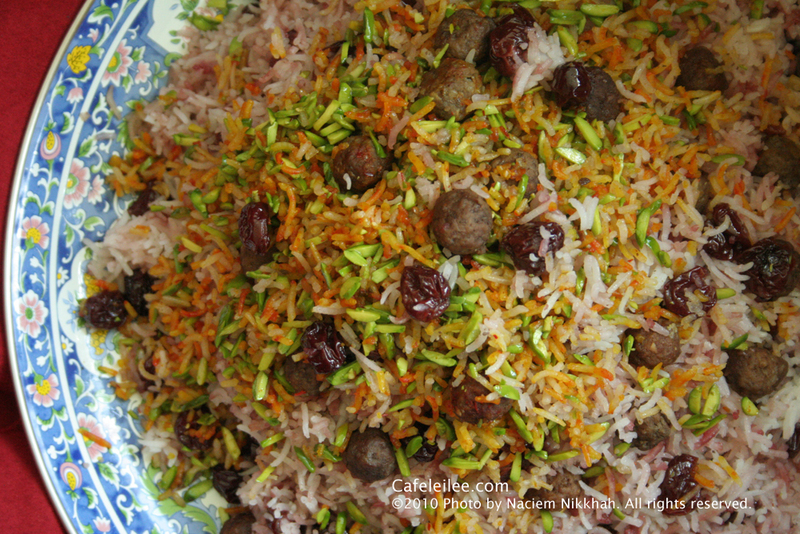 When you have transferred all the rice to the serving platter, spread the saffron and pistachio rice over it. اگر آلبالو پلو جزو خوش قیافه ترین غذاهایی که تا به حال خوردین نیست، دیگه نمیدونم چه غذایی هست. شما تو این غذا آلبالو، پسته و زعفران رو دارین که نه تنها رنگهای مختلف به این غذا میدن بلکه این غذا رو انقدر خوشمزه میکنن که موقع خوردن آدم فکر میکنه که تو بهشت داره غذا میخوره. در این مدت توی یک کاسه بزرگ گوشت چرخ کرده را با پیاز رنده شده و نمک خوب مخلوط کنید و کوفته ریزه ها را شکل دهید. کوفته ها را در یک تابه با کمی روغن تفت دهید تا پخته شوند. یک قابلمه بزرگ را پراز آب کنید و بگذارید جوش بیاید، آب برنج را خالی کنید و برنج را به آب جوش اضافه کنید. بگذارید برنج برای ۵ تا ۸ دقیقه جوش بخورد تا برنج قد بکشد و مغز آن پخته شود. برنج را آبکش کنید، و قابلمه را دوباره روی اجاق بگزارید با حرارت زیاد آب آن تبخیر شود. سپس حدود ۴/۱ پیمانه روغن ته قابلمه بریزید، و هر وقت روغن کاملا داغ شد، یک کفگیر از برنج را توی قابلمه بریزید. سپس با مربای آلبالو و کوفته ریزه روی برنج را بپوشانید. این عمل را تکرار کنید، یک لایه برنج و یک لایه مربای آلبالو و کوفته ریزه تا مواد تمام شود. شیره مربا را با باقی روغن روی برنج بدهید. شعله اجاق را کم کنید و در قابلمه را با دم کنی بپوشانید و قابلمه را با آن بپوشانید. بگذارید تا برنج برای حدود ۴۰ دقیقه دم بکشد. Hi... Im enjoying looking through your recipes, and I bookmarked this! I have a question though, You said to avoid the crust.... Do we eat the crust made by the rice or does it become too hard? I'm glad you asked this question. The crust in all Iranian rice dishes is actually considered a delicacy. That's why it always gets a special treatment and gets served as a side on a different platter. The crust of the sour cherry rice however tends too look burnt (because of the syrup) but it stil tastes amazing.